The White House today released a report by the Defense, Justice and Homeland Security departments on ways to spur the development of smart-gun technology, which restricts who can fire a weapon. Smart-gun technology typically uses RFID chips or biometric ID systems, such as a fingerprint scanners or grip recognition systems, to release a locking mechanism on a weapon. The technology was initially developed to prevent police officers' weapons from being grabbed in struggles and used against them. The military has also expressed interest in the technology for similar reasons. For two decades, smart-gun technology has advanced in fits and starts as wary investors kept purse strings tight and gun rights proponents at times fought its uptake. Then, in January, President Obama directed the federal government to conduct or sponsor research on gun safety technology, and to investigate ways to promote it. "If we can set it up so you can't unlock your phone unless you've got the right fingerprint, why can't we do the same thing for our guns? If a child can't open a bottle of aspirin, we should make sure that they can't pull a trigger on a gun," Obama said in January. Obama also instructed various defense and law enforcement agencies to "review the availability of smart-gun technology on a regular basis, and to explore potential ways to further its use and development to more broadly improve gun safety." He also commissioned a study by various defense and law enforcement agencies on the state of the technology. The new research, Report to the President Outlining a Strategy to Expedite Deployment of Gun Safety Technology, states that smart-gun technology "holds great promise." "By incorporating electronic systems into a firearm's design, manufacturers can give gun owners greater control over how a weapon is used, both by limiting who can fire the gun ('user-authorization technology') and by making a gun easier to retrieve if it is lost or stolen ('electronic recovery technology')," the report states. Additionally, the DOJ and DHS have begun a process to define, for the first time, the requirements that manufacturers would need to meet for federal, state and municipal law enforcement agencies to consider purchasing firearms with enhanced safety technology. They've committed to completing that process by October, and will also identify agencies interested in taking part in a pilot program to develop the technology. 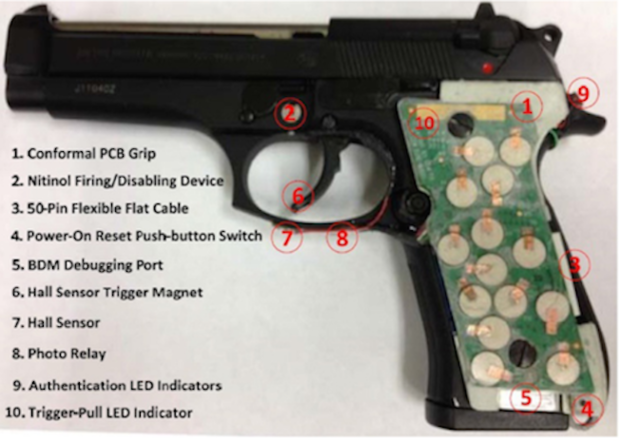 A 9mm Beretta semi-automatic pistol was the initial prototype for the New Jersey Institute of Technology's smart gun, which uses sensors to detect each gun owner's unique grip. The report also says that local and state governments can, through the DOJ, apply certain federal grants to the purchase of new firearms, including those equipped with advanced safety technology. "Together, these actions have the potential to jump-start the development of proven gun safety technologies that can save lives and preserve the effectiveness of our firearms. There is no problem that America's innovators cannot solve, and we are confident that by focusing the private sector's attention on smart-gun technology, we will unlock life-saving innovations," Valerie Jarrett, senior adviser to the president for intergovernmental affairs and public engagement, stated in a news release. Sen. Edward Markey (D-Mass. ), a proponent of smart-gun technology, applauded the report and its call for action. "Smart guns are smart gun safety policy," Markey said in a statement. "By unleashing the power of American research and innovation, we can literally keep guns out of the hands of those who should not have them and give law enforcement the tools they need to keep communities safer from gun violence. Smart-gun technology has the potential to save lives, especially those [taken] accidentally by guns." Last year, Markey and Rep. Carolyn Maloney (D-N.Y.) introduced The Handgun Trigger Safety Act, legislation that would support the use of "personalization" (or smart-gun) technology that would make a gun inoperable for anyone except specific people designated as authorized users by the purchaser of the gun. A recent Johns Hopkins survey found that six in 10 Americans want safer guns. "This announcement gets us closer as a society to giving consumers the choice for reliable, proven and affordable personalized firearms technology," said Margot Hirsch, president of the Tech Challenge Foundation, an organization that promotes innovation in smart-gun technology for safer communities. In 2013, the Tech Challenge Foundation, created by a group of Silicon Valley entrepreneurs, sponsored a $1 million competition called the "Smart Tech for Firearms Challenge," which resulted in the funding of 15 smart-gun innovators. The gun safety report states that the DOD will continue to help manufacturers test smart firearms under real-world conditions at the U.S. Army Aberdeen Test Center in Maryland. Manufacturers would be eligible to win cash prizes through that program as well. "The federal government stands ready to assist state and local governments as smart-gun technology continues to be developed," Jarrett said. "This effort presents a unique opportunity for law enforcement agencies to improve their own operations and encourage the development of advanced gun safety technology." In January, Obama also called for a new $500 million investment in mental health treatment and underscored the increased mental health coverage that the Affordable Care Act has made possible. According to the gun safety report, the Social Security Administration (SSA) is now moving forward with one aspect of that effort by publishing a proposed rule to help ensure that appropriate information in its records about people prohibited from buying a guns is reported to the federal government's criminal background check system. The rule would also provide a way for people to seek relief from the federal prohibitions on possessing a firearm for reasons related to mental health. This is just the first step in the rule-making process. Once the rule publishes in the Federal Register, the public will have 60 days to comment on the proposal to ensure that the SSA can incorporate feedback from a broad range of stakeholders before finalizing the rule. Next month, the White House will host a 50-state Gun Violence Prevention convention that will bring together state and local elected officials -- including governors, attorneys general, state legislators, and city and county officials -- who have been leaders in the fight to prevent gun-related deaths. The agenda will focus on state and local efforts to prevent gun violence through legislative and executive actions, including those focused on reducing gun violence in domestic abuse incidents and furthering research and development of smart-gun technologies. Convention participants will also have an opportunity to discuss ways states can improve their reporting to the background check system, particularly in light of new data recently released by the DOJ about the number of records each state has submitted to a key national database. "The actions the administration takes will help make our communities safer and keep more guns out of the hands of folks who shouldn't have them," Jarrett said. "That is just common sense."